This post is a round-up of first round action from San Jose and Washington on Monday and Tuesday. The time difference in San Jose and the lateness of matches/rain in Washington is not conducive for me watching so this week’s posts certainly won’t be comprehensive! Washington’s line-up for the WTA was pretty wild on Tuesday with six matches up first and two of them not streamed on WTA TV. Disappointing. Read on for 13 stories across and Monday and Tuesday’s action in the US. Maria Sakkari snapped a four match losing streak with a 6-2 6-2 win over Christina McHale in the first ever main draw match from San Jose. Sakkari won 74% of first serve points with the serve down-the-tee working well and found some great angles going crosscourt with the backhand. For McHale, it continues to be a challenging year. The American has won back-to-back matches just once in 2018 and is on the verge of falling out of the world’s top 100 for the first time since 2013. She had no answers in this match and didn’t have any weaponry to put pressure on Sakkari. Sneaking under the radar, Sofia Kenin is having a super year. The 19-year-old American is up to number 68 in the rankings and scored her 10th WTA main draw win of 2018 with a 6-4 6-4 win over Veronica Cepede Royg. I watched the second set which was close until Cepede Royg threw in a dreadful service game at 4-4 with back-to-back double faults. Kenin served out the match with plenty of help from VCR. Kenin’s game is pretty steady. To be honest, there’s nothing that really excites me about her game. Where she excels, in my opinion, is in her intensity and she seems to be a real battler on court. Mentality is so important in tennis and I think it will take her a long way. Victoria Azarenka needed three sets to get past Kateryna Bondarenko, 6-3 6-7(7) 7-5. A pair of backhand winners helped Bondarenko to save match point and then win the second set tiebreak. Azarenka rallied from *0-2 *0-40 in the decider to set up a mouthwatering second round clash with the number one seed, Garbiñe Muguruza. The pair will play in Wednesday’s night session. Vera Lapko scored her second top 50 win of the year, coming from a break down to beat the number seven seed, Zhang Shuai, 7-6(2) 6-0. Lapko was going too close to the lines early on in the first set but played with a bit more margin towards the end of the first set. I haven’t seen much of Lapko before but I was really impressed with her groundstrokes. Lapko plays Danielle Collins in the second round. Mihaela Buzarnescu just keeps on winning matches. I watched the first set of her 6-3 4-6 6-3 win over Sachia Vickery where she was a touch more explosive with her groundstrokes and willing to come forward. Her ability to reset after disappointments and meltdowns is really something! Buzarnescu has now won eight of her last nine three set matches. To be honest, I would have liked to see Buzarnescu take another week off as her schedule this year has been absolutely bruising. On court now vs. Sachia Vickery @mubadalaSVC, No.24 @MikiBuzarnescu is playing her @WTA-leading 21st main draw this season. To date, there have been 24 possible opportunities to compete on the 2018 tour calendar. Jo Konta won 12 games in a row to beat the number six seed, Serena Williams, 6-1 6-0 in just 51 minutes. Really stunned by this result which was Serena’s most comprehensive loss on the tour (Via WTA Insider). Obviously a great result for Konta who gets Kenin in the second round. The 21-year-old Brit, Katie Boulter scored her first top 50 win with a 6-2 6-0 thrashing of the number five seed, Aleksandra Krunic. Key to the win was Boulter’s serve as she dropped just four points behind her first serve and the depth on her groundstrokes. Boulter was raining down aces leading *4-0 in the second set before having a little wobble as the finish line came into sight. A disengaged and increasingly erratic, Krunic never really looked like taking advantage of the brief lapse from Boulter as the Brit held on at 4-0 and then broke for the win. I was impressed by Boulter during the grass court season and it’s encouraging to see her in WTA main draws and winning matches. Next up is the American, Allie Kiick who won her first WTA main draw match of 2018 with a straight sets win on Monday. This is a big opportunity for both players to make the quarter-finals of a WTA level tournament.
. @KatieBoulter1 ✅ def. Krunic 6-2, 6-0. It’s been a tough year for Svetlana Kuznetsova with wins hard to come by in her return from wrist surgery. The world number 128 (!) got her Washington campaign off to a promising start with a comfortable 6-2 6-1 win over Kristie Ahn. Next up for Kuznetsova is Ana Bogdan who knocked out the defending champion, Ekaterina Makarova on Tuesday. I liked Sveta’s chances of having a deep run pre-tournament and her first round performance has done nothing to change my mind. I don’t think that playing Bogdan will be a straightforward match though. Naomi Osaka served well in a 6-2 7-6(4) first round win over Bernarda Pera. The American had served for the second set at *6-5 but rather tamely got broken with two double faults. Pera hasn’t really recovered since a crushing loss to Daria Gavrilova at the French Open and has now lost her last four matches. For Osaka, she had her lower leg taped (if I remember correctly she also had it taped during the grass court season?) and was moving rather gingerly. I feel like this should be a good stretch of the season for Naomi so I hope the leg is not going to be an issue going forward. Sloane Stephens saved four set points in the first set to beat Bethanie Mattek-Sands, 7-5 6-4. This was a quality match with plenty of entertaining points. In the first set, Mattek-Sands was very aggressive and ripped on the Stephens second serve. Stephens saved the four set points at *4-5 including the first with a super pass (see point linked below). That game was the big one for Mattek-Sands and despite putting up a good fight, it was one way traffic for Stephens from then on. All in all, considering how little tennis she has played since the French Open final, this was a neat performance from Stephens and her attitude was mostly positive. Stephens finished with stats of 40 winners to just 20 unforced errors. Next up is Andrea Petkovic in the second round. 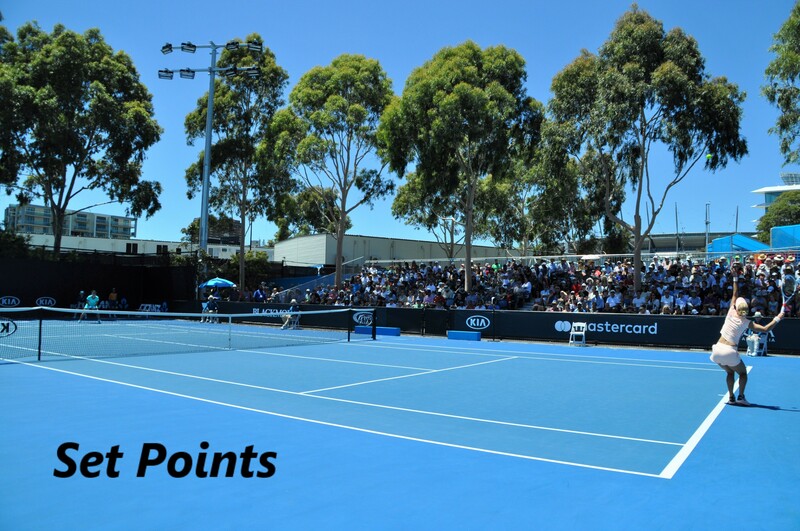 Belinda Bencic dropped just two points on the resumption of her first round match against Harriet Dart to win, 7-5 6-2. The pair were forced off in the early hours of Tuesday morning due to rain with Bencic serving at 7-5 *4-2 *0-40. Bencic looked focused and sharp, saving all three break points and wrapping up the match very quickly. Bencic will play Nao Hibino in the second round. Caroline Wozniacki pulled out of Washington before her first round match on Tuesday. I noticed she had her leg taped up in practice and that seemed to be the reason for the withdrawal. A trio of pre-tournament press conferences from San Jose were posted on the WTA Facebook page on Tuesday. Muguruza’s press conference is linked below where she talks about the San Jose surface being slower compared to Stanford but not slow. This definitely seemed the case to me from watching the first few matches on Monday. S Williams, one of the best servers in the history of the game, had only 40% first serves in and only 27% 2nd serve points won. This appears to me to be someone that loses in the 1st round picks up the appearance money, and laughs all the way to the bank on the way home. Serena does move quite well considering how fat she is. Buzarnescu had a towel over head and was sobbing dramatically after losing the 2nd set. I didn’t watch the 3rd set assuming she would lose. I was very surprised when I saw the final score and Doc Buz won. Because of all the years Buz missed due to injuries, she appears to be trying to cram ten years of tournaments into two years. Playing more events could result in playing less events, if Buz wears down physically and gets injured. How rude. I bet you are no prize pig. No self respecting pig would claim any resemblance to me. Serena being out of pro tennis shape in IW and Miami was understandable considering her very serious blood disorder following birth, but that was 6 months ago and she is still overweight. She will probably be in much better condition for the USO. Serena’s worth millions so I can’t see why she’d enter the tourney just for the appearance money, which would be paltry for her, or that a player of her enormous stature in the game would be so blase about losing that badly that she “laughed all the way to the bank on the way home”. I think the most likely explanation is the most straightforward one; Jo hit a purple patch and played at or close to her best, whilst Serena had an off day. In other news, Venus plays Heather Watson in the next round at San Jose, Belinda’s through to the next round in Washington after Nao Hibino withdrew, and Katie Bouilter’s a set down against Allie Kiick (match still to finish after being suspended). Yes that’s a shame, had a decent draw up to the semi-finals. Didn’t see the match, but my impression was that Kiick won it as much as (or more than) Boulter lost it? Heather (Watson) lost but managed to take Venus to three sets, so it’s been a good tournament for her, and Jo Konta’s through to the quarters in San Jose and still playing well. I didn’t see it either. Happy for Kiick though who has been through a lot. All in all, been a good week for the Brits with Murray and Norrie too. You just don’t have any right to call her fat, you aren’t fit to wipe the dirt off her shoes. One of my favorites Ysaline Bonaventure, LL, (R# 130, 23y/o, Bel) won today. The first time I saw her, I thought she looked like a 35y/o mom out playing tennis at a local club. Bonnie is a little overweight for a pro tennis player and wears sunglasses and a headband, which makes her look older than she is, from a distance. She may never break the top 100, but I always cheer for her. Bonnie got into the main draw when The Woz pulled out. Both my pre-tournament champs pulled out with injury so I don’t think it’s fair for me to ruin someone else 😂. Osaka would seem a good pick for Washington and I think she could be a dark horse for the US Open. I was a tad worried though about her lower leg taping on Tuesday and she seemed to be moving gingerly. The Moo’s player picks are the kiss of death. Great photo of Konta knocking the fuzz off the ball at night on WTA Insider. I’ve never seen a picture like this before.